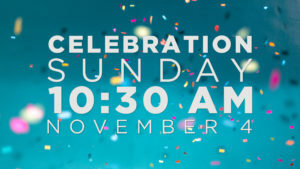 November 4 is Celebration Sunday! Christ Community, I hope you will join us this Sunday as we celebrate our 33rdyear as a church in the Lake Norman region. We have so much to be thankful for. By God’s grace, we are growing in each of our ministries, including children, students, and adult small groups! God has given us a bright future, and for this we want to celebrate! We also want to celebrate all the ways God has blessed our church financially this year through We Believe. Our church has responded to this one-year campaign in a great way. I will give an update on the total and where it leaves us as we prepare to roll into 2019. If you’d like to give to We Believe, you can do so by giving onlineor by bringing your gift with you on Sunday. If you desire to make a special end-of-campaign gift, you can do so at any time. If you desire to continue giving to We Believe, you can do so, and it will be applied to our debt payments throughout the year. Fill A Bag. On our first Sunday, over 220 bags were taken to be filled by our church. If you were not able to pick one up on Sunday, make sure you grab one or two this Sunday. Fill it up with the recommended items, then bring it back! This is a great way to serve our community, as all 400 bags will be distributed t ofamilies in need this Thanksgiving. Thanks to a partnership with Tyson Foods, we will include 400 packs of frozen chicken for the families to enjoy on Thanksgiving Day! Spread the Word. Go to the Thanksgiftingpage on our websiteto download graphics to share on your social media pages or send to those who might be in need this holiday season. We want to make certain 400 families are blessed this season. Our small groups are placing doorhangers on 3,000 homes in key parts of our community. If you’re looking to hop into a small group, this is a great time to join with one of them! 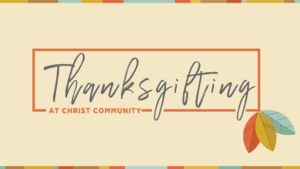 Serve at the Event – We need over 100 volunteers to pull of our Thanksgifting service on Sunday, November 18 at 2:00 p.m. Please register to serve nowso we can count on you! Serving will be greeting, watching children, counseling those who respond to the gospel, and helping carry groceries to cars. Don’t miss this opportunity to minister! Give to Support the Event – Several have asked if there is a way to financially assist with Thanksgifting. There are a number of expenses associated with this event, so you can donate financially by noting “Thanksgifiting” on your giving envelop, or you can give online at com. Please make sure you note “Thanksgifting” online. All financial gifts will go to provide more food if needed, resources for our service, and other needs that might arise in the days ahead. Please be in prayer for our staff team as we are hard at work getting ready for this awesome opportunity to share the love of Christ with our neighbors. 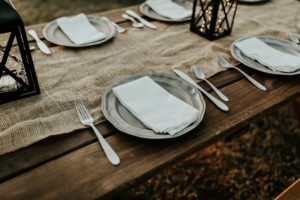 My wife and I have had such a pleasure meeting so many people from our church through hosting these dinners for each age group. We’ve met with those in their twenties, thirties, forties, and fifties. We have had over 300 people in our home! It’s been such a blessing. Sunday, December 2 at 9:15 a.m.
You can choose to register for whichever one of these descriptions best fit you and your season of life. We look forward to enjoying a meal with you soon! I’m excited to gather with you Sunday as we celebrate God’s faithfulness to our church! I look forward to continuing in our series in Mark as we wrap up Mark 9.